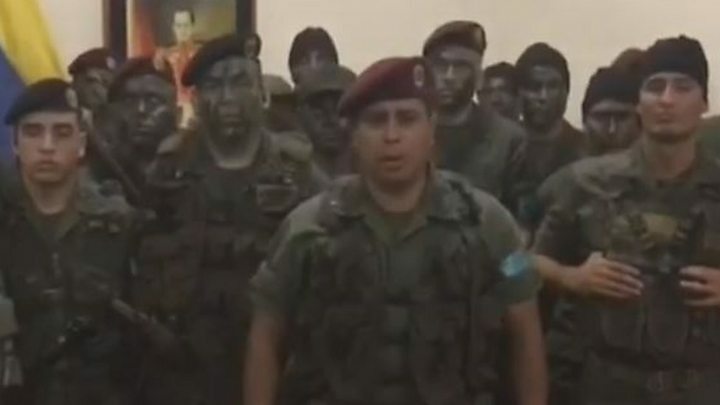 Media captionArmy officers posted a video calling their move "a legitimate rebellion"
Arrests have been made in Venezuela after soldiers tried to launch an uprising against President Nicolás Maduro. Two attackers were killed and at least eight were arrested, Mr Maduro said. A video released on social media showed uniformed men saying they were rising against a "murderous tyranny". Venezuela has seen months of protests. 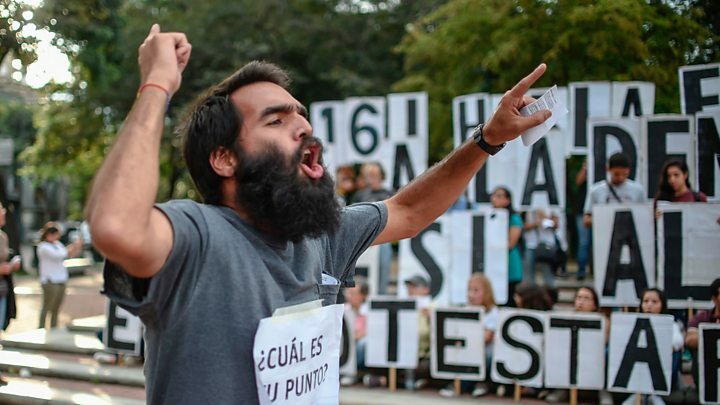 "This is not a coup but a civil and military action to re-establish constitutional order," said the leader, who gave his name as Juan Caguaripano. The ruling Socialist Party's deputy leader, Diosdado Cabello, called it a "terrorist attack" on Twitter. Army chief Gen Jesus Suarez Chourio said: "What happened today was a terrorist, paramilitary, mercenary attack paid for by the right [the opposition] and its collaborators, paid for by the North American empire" - a reference to the US, which has denounced President Maduro's recent actions. 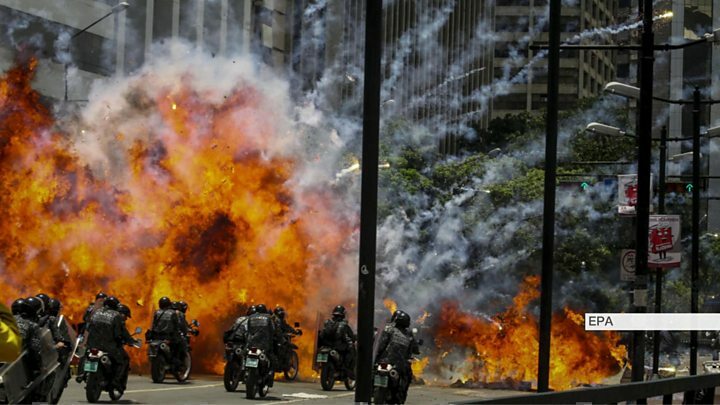 Despite the reported arrests, Juan Carlos Colina, a reporter with the Venezolana de Prensa newspaper, told the BBC that loud explosions continued to be heard at the base in the early afternoon, local time. In his short speech, the rebel leader said that his group - which he called the 41st Brigade - was standing against the "murderous tyranny of President Nicolás Maduro". He named young people who have died after attending anti-government protests: Neomar Lander, Geraldine Moreno, Juan Pablo Pernalete and "lots of others with their cardboard shields". Lander, 17, and Pernalete, 20, died earlier this year, while Moreno, 23, was shot in the face in a 2014 demonstration. Two members of the National Guard were later jailed for her death. Regular protests have been held in the country since April. The opposition accuses left-wing President Maduro of trying to entrench his power. On Saturday, the newly inaugurated Constituent Assembly held its first session. 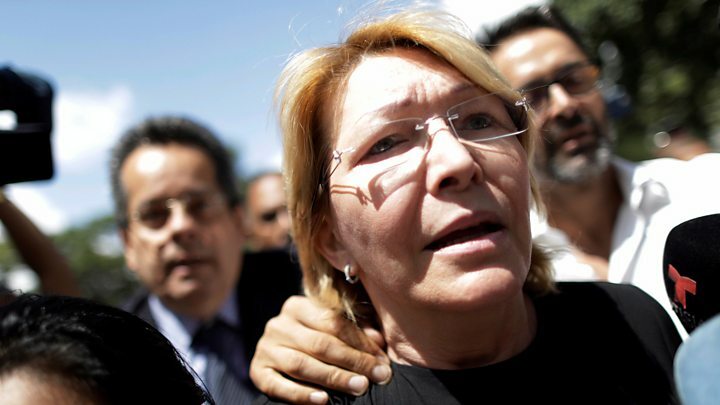 It immediately voted to dismiss Chief Prosecutor Luisa Ortega, a former ally of President Maduro turned major critic. Members of the assembly were elected after a controversial vote last Sunday, in which no opposition candidates participated and which has led to allegations of voting fraud. The government has strongly denied the allegations. Mr Maduro repeatedly says he is trying to keep the peace. The assembly has the power to rewrite the constitution and could override the opposition-controlled National Assembly.